Before any management project can be implemented, identification of appropriate and feasible goals for a par ticular stream system must occur. A thorough attempt should be made to understand the ecology of the system, determine the threats to ecosystem integrity, and estab lish realistic endpoints. For ecological engineering, this means determining current and past anthropogenic activ ities affecting the system (Table 2), understanding how the ecosystem is currently structured, and predicting how habitat and biotic modifications will most likely affect stream ecology. Although there are many other social, economic, and political aspects that are important to consider when designing a successful management pro gram, this article focuses only on the ecological component of stream management. back to a state that is more reflective of its predisturbance condition. Since restoration is very difficult to accomplish due to permanent watershed disturbance, channel altera tions, or political issues that make it impossible to recreate the predisturbance environment, this effort is more com monly referred to as rehabilitation, or restoring the ecosystem as much as is practical. The ecological goals of stream management can be very diverse and depend on aspects such as regional climate, permanent watershed alterations, current physical and biological state of the stream, and desired biological end points. Management can be geared toward getting the most natural system as in restoration, or emphasize cer tain components or functions of a system. For example, streams have been managed for optimum fisheries, nutri ent retention, boat traffic, recreation, flood control, waste transport, or water withdrawal. Managers must often contend with multiple goals, such as restoring native warmwater fish populations while maintaining intro duced coldwater sport fisheries below hypolimnetic release dams. Trying to reach a compromise between goals may lead to a compromise in ecological integrity, as optimum environmental conditions for each often can not realistically be met. Once specific goals have been established, the next step is to begin designing a management plan and creating strategies to achieve it. In every approach, and especially in ecological engineering, this phase is critical. Unlike typical engineering, a large part of the ecological engi neering process is self designed by nature. Once the initial conditions are set up, the system is basically left to organize itself with minimal human interference. Unfortunately, predicting exactly how the system will do this can be difficult. Using basic ecological principles, managers can get an idea of the general conditions needed to support the desired ecosystem, allowing them to deter mine an adequate starting point for their goal. Valuable information also can be gained from a failed management process, but associated costs may be high. During the developmental process, project timelines should be considered. The time available for manage ment, time in which the desired outcome is detectable, and time devoted to long term monitoring need to be addressed. These are key questions because currently it is impossible to determine how long the self organization process of different components will take. Given the dynamic nature of streams, a stable ecosystem may never occur to assess the effectiveness of the management project. Another important element in stream management is the spatial scale of the project. Does the management area encompass a reach, several reaches, a segment, a watershed? Will it include riparian areas, adjacent flood plains and wetlands, the watershed, or the entire basin.? These aspects greatly influence the ecological strategy and potential success of the project design, as larger projects often require much more planning and cost. Managers are faced with many ecological challenges that are unique to lotic ecosystems. 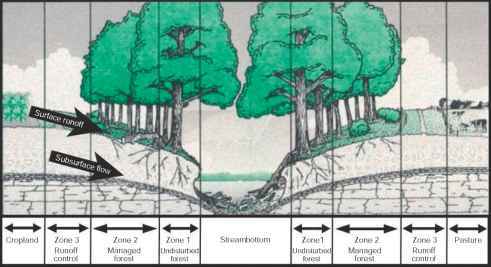 Stream ecosystems are constantly changing environments and can be thought of as being in a state of dynamic equilibrium. This increases the difficulty of predicting how various ecosystem components will react, and can change interactions on relatively short timescales such as after large floods. In addition, streams can vary substantially in size. Stream size and order can alter the functional importance of ecosystem components. For example, carbon sources in smaller, clear streams may be dominated by autotrophic primary producers such as algae and macrophytes, while larger, more turbid stream carbon sources are likely dominated by dissolved and particulate organic material carried down from upstream. The longitudinal characteristics of streams also pre sent many obstacles for successful stream management. Streams can flow through different geographic bound aries that include various forms of landscape development and pollution sources. Identifying and reducing a large proportion of these sources can often be logistically impossible. When focusing on long segments, managers must also commonly deal with tributaries and significant groundwater input. Streams regularly cross political boundaries, also making man agement difficult.